The July/August 2015 issue of Global Living Magazine - a lifestyle publication for expatriates and global citizens who consider the world their home - and playground. 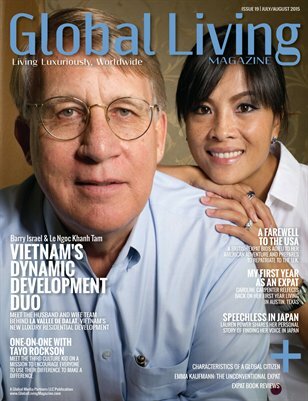 In this issue -- Barry Israel and Le Ngoc Khanh Tam: Vietman's dynamic development duo; my first year as an expat; characteristics of a global citizen; one-on-one with UYD Media's Tayo Rockson; expat entrepreneurs; leading in a global mosaic (part VI: We are Sisters. We are Family); expat book reviews; and much more!